Be the first to share your favorite memory, photo or story of Constance. This memorial page is dedicated for family, friends and future generations to celebrate the life of their loved one. 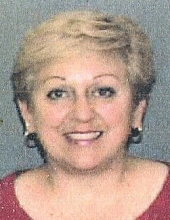 Constance "Connie" E. Castellini, 74, of Solvay, passed away Thursday at The Centers at St. Camillus. Born in Syracuse, she was a resident of Solvay. She enjoyed painting and cooking. Connie was the owner of a successful printing service. Connie was predeceased by her parents, Margaret and Gunthar Bauermann. Surviving are her husband of 56 years, Joseph Castellini of Solvay; daughter, Lynn Normoyle of Camillus; son, Michael (Stacey) Castellini of Camillus; and grandchildren, Clare and Maeve Normoyle of Camillus. The family would like to thank the 3rd floor staff at St. Camillus for their compassionate care given to Connie. The family also extends their thanks to John Mastri for his help in making sure Connie was well taken care of. Relatives and friends may call Monday, March 25 from 10 to 11 a.m. at Buranich Funeral Home, 5431 W. Genesee St., Camillus. Services will follow at 11 a.m. at the funeral home. Constance will be laid to rest in Greenlawn Cemetery, Warners. To send flowers or a remembrance gift to the family of Constance "Connie" Castellini, please visit our Tribute Store. "Email Address" would like to share the life celebration of Constance "Connie" Castellini. Click on the "link" to go to share a favorite memory or leave a condolence message for the family.